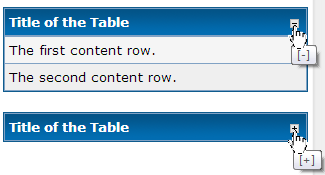 Today we will learn how to add MyBB's collapse buttons to any table. Interesting? Well, its easy too. Lets see how it can be done. 1. The red text part ID of the collapse button must be unique and not be repeated. 2. The ID must have the word "_img" at the end of it. As we want to show the collapse button in out title bar, we will place the code Just after the title, within the thead class. Now we will bind the area with tbody reffering the same red unique text and instead of '_img' we have to place '_e' now. >> Blue text is newly added code. Current time: 24-04-2019, 01:04 PM Powered By MyBB, © 2002-2019 MyBB Group.